Two friends from Suffolk climb Scotland's two highest mountains and canoe between them. In doing so, they raise money for the RNLI. The results are in, the lines are closed and Bens by Boat 2009 will now gracefully retire. Since its inception in early August the project has been an occupation in its own right; fun, drudgery, worthwhile, fruitless and a learning curve several times around. It's kept us busy, had us wishing we'd never started but turned out to be ultimately satisfying. We hope you've enjoyed keeping up with us on the blog and we're glad to have it as a ready-made journal to look back on. which we're quite proud of and the RNLI are immensely grateful for. Now it may have seemed that this has just been two chaps and canoe but that's some way off the mark! Loads of people have helped us along the way and we'll try not to forget anyone. Julie 'the Third Paddler' Black for just about everything - cake, photography, publicity, enthusiasm, networking, lifts, ballast, picnics, ideas, inspiration and generally making sure things got done. Without Julie, things would have been far less interesting. The talk we did for the more adult audience (anyone over the age of five) went very well indeed. There was always a real danger that nobody would turn up and we'd be giving the talk to our parents and the nice lady who opened up the school for us but thankfully we counted forty ish people on the night. Local canoe club members, scouting connections, relatives, friends, benefactors and interested incidentals alike patiently watched and listened for nearly an hour as we recounted our adventure and reeled off tales of derring do. Several people hung around afterwards; asked questions, chatted and, the kids especially, played around with the boat and gear. Everyone seemed to have had a good time and a few people have since remarked to Alex that they enjoyed it, which is nice to hear. Bucket rattling at the end turned up another £60 for the lifeboats; a stonking bonus. This is very nearly Bens by Boat 2009's last hurrah. Sponsorship money is being collected (shortly to be by bailiffs in some cases) and totted up ready to head up to Loch Ness Lifeboat Station over the next couple of weeks. Stay tuned for the thrilling finale! Seeing as the talk we did for the local primary school children went so well, we're going to do one for the more mature audience (anyone over the age of 8 really) as well! Bucket rattling on behalf of the RNLI on exit. Plenty of photos, videos and tales of canoe-bound heroism. Learn about cordon bleu pasta cookery, the profound effects of wind and rain on Alex's mood and the joy of proving people wrong. More interesting than the average slideshow or your money back! We spent a while this morning at the local primary school. The children have been learning about the lifeboats over the last month and Alex's old headmistress asked us to come along and talk about our trip. We were very happy with how it went. The kids showed every sign of loving it and were thrilled to be involved; asking and answering questions, helping us carry the canoe around the hall and telling us about the time they went on a boat and up a mountain. One boy of six proudly told us that he too had been up Ben Nevis! We were impressed but later discovered that he had also, according to him, been into space. The school did a little piece on their web site about it too. Very nice of them. Firstly, thanks for your patience waiting for the full account of the trip to arrive. We thought it would be cool to have the route shown on a map, with photos and videos stuck on at the appropriate places, and that's largely what we've done. It took longer than we thought it would. Alex's internet has been on the blink and the mapping software only works well on days of the week with a letter B in them. Click on a white marker to see where we are and what we're doing. With most of the markers, if you click on the title in the speech bubble that pops up a photo or video will appear in a new window. The map is centred on the start of the first day so just zoom in and follow the route from there (go clockwise from the first point for the first day (Cairngorms)). You can also view the map in a separate window by clicking here. Now that the trip is documented, we'll soon be putting Bens by Boat 2009 to bed. There's still time to make a donation to the RNLI though! Visit the justgiving website by clicking here. The lifeboat folks are hugely grateful for anything that makes their jobs safer and we appreciate the support. We've been working on a full account of the trip for your viewing pleasure and it's nearly ready. It's taken longer than we thought it would. Alex's internet connection is on the blink, which isn't helping get it done very fast and Oli is pretty busy with work at the moment. We hope that it'll be worth the wait when it arrives in the next few days! We've been back a few days now and are beavering away at getting photos and a proper account of the trip sorted. Hoping to have it done this week but Oli is mega busy so this week could quite easily become next. Bear with us! We've been having a bit of a think about where we want the money to go and had our decision helped along by a comment left on the blog. Since they were kind enough to thank and praise us (flattery will get you everywhere) and because they operate on a stretch quite popular with canoeists (where a stack of the money raised has come from - good job, Song of the Paddle forum) we'll be directing the cash at Loch Ness! I spoke with their main man, Ewan Cameron, yesterday and he's very grateful to each and every person who donated. "We run on donations and volunteers alone. We really do rely on the public to keep going." So a massive thank you if you have donated. We breakfasted on our last six ginger nut biscuits and started treading the path up Ben Nevis at 08:00. We allowed plenty of time for what would normally be a simple up and down trip as Oli's right knee hasn't quite been the same since the particularly tricky portage into the cove near Hopman. The walk itself was uneventful. The weather was excellent but the path wasn't very interesting at all. We were pleased to reach the summit and mark the successful completion of the expedition and enjoyed a huge feeling of satisfaction on the equally boring path down. The last two weeks have been fantastic; hard work at times but well worth the effort. We're now looking forward to getting back home, having a shower and a good meal and sorting out the photos and videos from the trip. We're back late tomorrow night and hopefully should have a more thorough account of the trip on the blog before the end of the week. Quite an early start and on the canal before 07:00 this morning (after a short portage along the road from Laggan Youth Hostel). We got onto Loch Lochy a few minutes before daylight and paddled with a light wind at our backs for once! We weren't going to miss the opportunity the weather had finally given us and pulled in to rig the sail. The wind was getting up quickly by now and we spent a glorious (if cold) hour speeding along under sail, surfing the waves going down the Loch. The wind died and was replaced with brilliant sunshine and we paddled the last two miles as the mist burnt off the valley. We elected to paddle the River Lochy rather than the canal to finish the trip. We reckoned on it speeding us along with the flow and delivering us to downtown Fort William in double quick time (Oli needed to be on the 14:15 bus to Inverness to pick up the car from where we left it nearly two weeks ago). The way was littered with shallow sections and hundreds of fishermen, which slowed progress considerably, but the biggest problem was to come about three miles from the end. We rounded a corner to find a very short section of quite lumpy water. We could see a line down it but didn't fancy taking the risk of a swim (it was the biggest white water we saw all through the trip) if it went wrong. The portage past it was short but arduous and time consuming. We arrived at Fort William just before 14:00, pulling into a grotty inlet a bit before the pier with barely enough time for a photograph before Oli raced for the station. Several hours later Oli returned with the car and Alex pryed himself from the comfortable armchair at the pub to meet him. We're now in Glen Nevis where we'll spend the night ready to climb Ben Nevis tomorrow morning. Quite a big paddling day today. We got on the water at 07:30 and headed onto a perfect Loch Ness. The sun hadn't yet properly risen but it was shirt-sleeves warm already. The water was mirror flat, there was barely a breath of wind and we were making great progress. Our luck couldn't last though and after an hour of perfect conditions the wind started to blow in our faces. Later, the rain came and it was quite grey for a while. We pushed on and near enough exactly eight hours after leaving our camp we were at Fort Augustus at the south end of the loch. We portaged up past the locks, popped into the shop to pick up some food (we'd somehow nearly finished our 3kg of pasta) and then started paddling the section of the Caledonian Canal leading to Loch Oich. We made good progress, although hindered by having to portage two locks, and got to the beginning of Lock Oich at around 19:00. We had a quick second lunch before heading off onto the dusky loch. No wind and perfectly flat water to start with but quite quickly a moderate tailwind and some rain whipped up. We were pleased to have the wind at our backs for once and sped down the loch, under the bridge at the other end and back onto the canal. Our target was to find Laggan Youth Hostel. We got ourselves to the appropriate section of canal for a fairly decent 20:30 but after having difficulties getting the boat around and finding suitable paths we didn't make it to the youth hostel until nearly 22:00. The facilities are excellent - This is being posted from the internet enabled computer that they have one of in every room! When we got up the wind was a bit lighter than yesterday so we took our chance and struck out across the bay. It was quite choppy for so far inland but progress was surprisingly good. It took us about an hour and a half to reach Kessock Bridge, a good milestone. We paddled a little further up the coast to the sea lock to pick up our canal licence and have lunch. We portaged past the Muirtown locks (locks don't work for canoes unfortunately) and hit the canal. It was nice to be on some smooth water after almost a week at sea. The wind was, of course, in our faces but we still made fast progress, especially without the waves. We stopped off for much needed showers just before getting onto Loch Dochfour and have continued to the beginning of Loch Ness. We're camped on a small beach near the entrance and are hoping to make the other end tomorrow. Early start this morning and the weather looked promising. Alas, this was to change. No sooner had we got on the water the wind (in our faces, naturally) picked up and the skies went grey. We had paddled for about and hour before we decided we were getting nowhere fast. Battling the wind, tide and rain had also dampened our spirits. So another portage it had to be. Some thrashing about in the gorse uncovered a track, which we followed to the back of one of Fort George's firing ranges. Here we joined another, which led us straight out of the camp gates. The range wardens may well have been perplexed at seeing two chaps with a canoe wandering off their firing range but fortunately they showed no sign of imprisoning us. We portaged past the airport, past a cemetery and through a golf course to get back on the water just after lunchtime. The wind was still in our faces but the tide was with us enough to allow better progress than earlier (although still not good enough to get under Kessock Bridge today). We're camped south of Arltulie Point hoping the wind and rain currently battering the tent will disappear before tomorrow. Yesterday's rough seas and strong winds had thankfully disappeared by the time we woke up this morning. Not wanting to waste good weather we got on the water pretty sharpish and made good progress towards Nairn. We had a bit of wind in our faces but less than when crossing Burghead Bay. After five hours paddling we pulled into Nairn harbour and headed for the town centre. We picked up some food for the next few days and fish and chips for lunch. Tourists and locals alike took an interest in the canoe nestled amongst the sailing and fishing boats. The best sea paddling of the trip came this afternoon. We left Nairn harbour to find glassy smooth seas and shallow, gentle swell. The hazy sun of the morning had been replaced with slightly dull skies but there was't a breath of wind. We got up to a good speed and were at the end of Whiteness Head only two hours later. We're now camped in the dunes near the mouth of the lagoon listening to the seals (we counted seventeen of them when we landed here!) flap about on the beach. Unfortunately the Met Office got something right for once and the strong westerly they predicted has arrived. No chance of making any progress paddling against a force 5 so we're in the tent for the day. But all is not lost - We've used the time wisely, to brush up on our porridge cookery and needlecraft! The wind is meant to be swinging all over the place for the next day or so, hopefully including a south-easterly we could do with, so we should be able to make progress again tomorrow. Our initial plan this morning was to launch from Hopeman harbour but as the sea conditions had improved so dramatically we decided to launch from a sandy cove close to where we had camped. We then followed the coast to Burghead before starting the long paddle across Burghead Bay. This proved to be very hard work as a brisk headwind had built up. We arrived at the dunes near Findhorn in time for lunch and a chat with a nice local chap. After lunch we launched again and followed the coast westwards but the going was slow due to currents and the wind. After a tiring hour we decided there was little point in using so much energy to make so little progress. We landed again and portaged up the beach to find a campsite. We found a nice one and are now sat by the fire amongst the dunes along the edge of the Culbin Forest. We got up late today, enjoying the comfort and convenience of the pill box. A nice chap called Keith, a member of the Song of the Paddle web forum, came by to see how we were doing (knowing where to find us from yesterday's blog). We chatted about the sea conditions and he kindly gave us his phone number if a contingency plan was needed. The sea was calmer than yesterday but the breakers were still large enough. We bided our time and took a run up when we thought the incoming waves were small ones. The first breaker, however small, crashed into Oli's face and settled in the bottom of the canoe (about six inches of water) but we were able to push through the others and get to the more pleasant sea behind. The swell was about two metres high but not steep enough to pose a problem. We made fairly good progress but after an hour and a half the weather and sea conditions were getting a bit worse. We decided to head into Lossiemouth harbour rather than commit to the long rocky section of coast to the West. We had lunch, talked to the harbourmaster and went to the pub to dry out for a couple of hours. By now, being quite late in the day and the weather not ideal, we opted to portage to the next harbour so as not to lose too much ground. We camped near a quarry to the East of Hopeman ready to put in at the harbour. Weather was pretty much the same as yesterday. Starting well, then rain (about an hour) and then good for the rest of the day. Progress was again good. The Spey doesn't change massively along its course but we knew when we saw big red river cliffs that we weren't far from the sea. We were quite surprised when we got to the last bridge over the Spey. The place was a wasteland! Piles of trees and debris littered the beaches, dragged from upstream and then dumped by the storms a few weeks ago. We paddled along a lagoon to the village of Kingston to see if the waves would be any more gentle. They were, but not gentle enough. The breakers would thrash and soak us before we could get to the rolling sea behind them. We've come a little along the coast on foot and are camped in a pillar pill box about half way to Lossiemouth. Woke up this morning to smooth flowing water, blue skies and brilliant sunshine. We got on the water just before 09:00 and made good time on the flat stuff until Cromdale. By now it was raining (only lasted an hour though) and the water was rougher. There were plenty of small rapids, which were fun but not too testing. The roughest water came just before Knockando, where we did get a bit splashed, and there were still plenty of smaller lumps and bumps up to where we're camped, just downstream of Charlestown of Aberlour. Hoping to reach the sea tomorrow and that the good weather continues. Had a lie in this morning to recover from yesterday's exertions. Got down to Loch Insh, sorted gear and paddled away from the beach at a leisurely 13:00. It only took us a few minutes to get onto the Spey, which we've followed for about 15 miles. Current was reasonably swift with some small rapids. Now sitting by the campfire a little downstream of Boat of Garten. Bed soon. Plenty to do tomorrow. Day 1 was long. Very long. We started walking at 05:45, watched the sun rise from Cairngorm summit at 07:00 and were on top of Ben Macdui for 09:30. We could have stopped here but across the Lairig Ghru lay more mountains to conquer. These took us much more time than we were reckoning on and were hard work. We got back to the car at 21:00, absolutely shattered. We're planning on looking back on the experience fondly once we've fully recovered! Have been driving today. Weather has been good and we have made good progress. Had a run in with the law at Pitlochry about how the canoe was strapped on. They were surprised we'd made it so far without already being pulled over. Straps were altered (better visibility) and everything amicably sorted at the station. Just dropped into Glenmore Lodge to leave details of our route and check the weather forecast. We've been luckly and have got the only bit of high pressure there's been in ages. All looking good for an early start tomorrow. Alex has just about stuffed the last pack of biscuits and box of matches into the bags and barrels. 03:10 ish is not bad going for him actually. Packing for trips like this has before been known to last until daylight at Castle Purser. Everything fits and will stay dry and Alex can hopefully remember which barrel he put the car keys in the bottom of. Julie's cake is large and dense enough to have its own gravitational field and had to be packed at the geometric centre of everything else to avoid imbalance. The overall weight of equipment, food and clothes is, technically speaking, lots. Before adding Oli's rucksack (more than likely light as a feather) Alex's bathroom scales estimate something in the region of 164lbs of stuff (before a few loose bits and pieces) coming along for the ride. Less than five hours until kick off. Despite being the plan all along it's only now, the night before we leave, that Alex has gotten round to checking that updating the blog from his mobile will work. If you are reading this then it is relatively safe to assume that Alex's Blackberry and the blog are in functional harmony. If you can't read this then Alex is cursing the information super-highway with all his might. Only a short post today as it's best to get some sleep before a 12-hour drive. Stay tuned as we'll try to update the blog regularly (or at least semi regularly) while we're away. 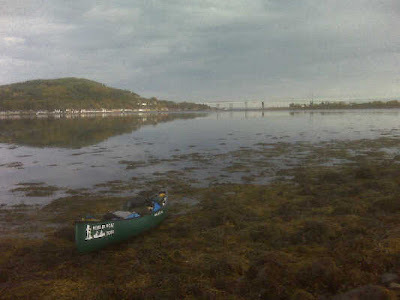 Although some may think that 200 miles of canoeing combined with climbing the two highest mountains in Scotland already sounds like quite a fortnight's entertainment, we have thought of a way to further our acheivements in an attempt to encourage some more sponsorship from those still unimpressed by our expedition (see link on the right ---->). If the weather is on our side, there are a further 7 (yes seven!) mountains which we hope to summit in the two mountain days. As there are 9 mountains in the UK over 4000ft, and as they all happen to fall withing walking distance of either Ben Macdui or Ben Nevis, it would seem a shame not to fit these in whilst we are in the area. Although this potential extension to the trip converts two walking days of around 10 miles into two days of 17 miles and turns 'Bens by Boat' into the much less catchy 'Bens, Aonachs, Cairns, a Carn, a Sgor and Braeriach (by Boat)', we are sure we are up to the challenge and if we don't get lost in the cloud and the snow, we will hopefully return to find that we have raised lots of money for the RNLI. 1) Loch Insch Watersports facility (http://www.lochinsh.com/) have very kindly allowed us to leave our vehicle there for the time we are in the canoe. Thanks very much to Clive Freshwater, the main man at the centre. 2) Major McMasters, camp commandant of Fort George army base was also very helpful regarding passing through military firing range danger areas in the Moray Firth. Thanks very much to him and his staff. Imagine our amusement when, whilst looking at the Ordnance Survey maps of the route, we discovered that we have to pass through two separate firing range danger areas on the seafaring section. Not wanting to end up as target practice it seemed sensible to talk to someone important. It turns out we are welcome to pass through, will most likely do so on days where there is no firing (nothing is booked during the timeframe we expect to pass through) and, even if there is firing in progress, it will be halted for as long as it takes us to pass. They have sentries and a radar system specifically to look out for boats. So now we have the backing of the Scottish leisure industry and the British army. What could go wrong? We visited the offices of the Suffolk Free Press earlier today and had an interview (more of a chat really) about the trip, the charity, our backgrounds and the like. Hopefully they've got enough to make a catchy article out of and therefore generate us some publicity. Journos have a disconcerting habit of writing in shorthand so hapless interviewees can't spy over their shoulder and see what is being written about them. "Canoeing - yeah, good fun stuff. Looking forward to the trip. We're no experts but should manage fine." "Dangerously underprepared local men bite off more than they can chew." Looks like we're relying on him to pitch it well on our behalf. The paper prints on Wednesday nights and hits doormats on Thursday mornings. We're as curious as anybody to see what they put about us! We first saw the idea of sailing a canoe on Song of the Paddle (http://www.songofthepaddle.co.uk). The forum on the site is the forum for the UK open canoeist and has plenty of people and good information to pick up tips and ideas from. Canoe sailing rigs vary from simple downwind only setups, comprising umbrellas or a jumper between two paddles, to the much more elaborate, making the canoe not much different from a sailing dinghy. Wanting to only slightly overcomplicate things we opted for our sailing rig to be a downwind only design but to have more tug than the simplest of the simple (umbrellas/jumpers). Alex had a Terra Nova bothy bag that was a good size for the sail, a mast and mast foot were assembled from old tent poles and a sink plunger and a boom was fashioned from a broom handle (we are in fact on boom number two after an unfortunate episode involving said broom handle, a lathe and a dent in the wall). Add some rope and we have a sailing rig. Unfortunately, the likelihood of us getting favourable winds where we want them is low. Wind generally comes from the South West in the UK, which only helps us out with the Spey section of the trip (down river and fast flowing in places anyway). The route in the sea is side on to the probable wind and the lochs, rivers and canals of the Great Glen straight into it. The bit of luck we’re banking on is getting a North Easterly for the Great Glen section. We are informed they do happen from time to time! arrived at Alex's house this morning. As mentioned here, we thought pumps could make bailing easier (as opposed to using tupperware boxes). The bicycle-pump style Easybailer will strap under a canoe seat, out of the way, but will help massively if we do need to empty the canoe away from shore. It emptied Alex's kitchen sink in no time at all and is well worth while having about considering how little room it takes up. 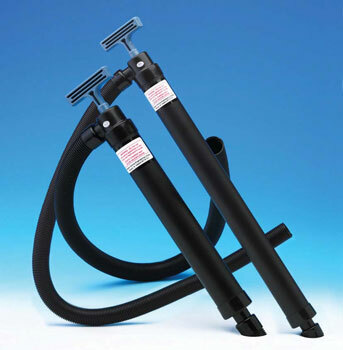 They're made by Munster Simms Engineering, probably better known as Whale Pumps (http://www.whalepumps.com) and can be seen on page 44 of http://www.whalepumps.com/documents/brochure/WHALE_MARINE_2009_reduced_file_size.pdf. We met with a very nice chap from the Suffolk Free Press (local paper) down by the river last night. He got loads of snaps of us in the boat and seemed very interested in the trip. We're meeting with a reporter later this week (or early next) for an interview and should be featured in the issue coming out on the 24th September. We're also going on the lecture circuit! People have read the blog, talked to other people, who have talked to other people, and word has got back to us that the local primary school would like us to give a presentation about the trip. It turns out that the kids have been learning about the lifeboats recently (good coincidence) and are raising money for the RNLI themselves. For the children (and the teachers) it should be an exciting morning with cool pictures and interesting stories about our adventures. For us it's more publicity. Good news all round really. We wanted the Bens by Boat logo on the canoe so Oli donned his creative hat and got busy with scissors and sticky-backed plastic. The next task was to identify the least scratched areas of the boat and rub them down with white spirit. Most of the sticking down was done by Oli. Not wanting to interfere with an artist at work, or take responsibility for mucking it up, Alex made the tea and kept out of the way. Though luckily he was on hand to point out mistakes. Four hands were needed at times. We had just enough time for a test drive before our photographer, the ever-present Julie, had to go. We spent this morning paddling from Sudbury to Bures. We’ve done this bit of the River Stour quite a few times before but wanted to have a go with the canoe laden with the kit we’re planning to take with us (or at least the equivalent weight and volume of house bricks). We hadn’t got a schedule to keep to so went at a fairly leisurely pace. The water level was down and many of the weirs were dry so we took the opportunity to practice our portaging technique, which, with the added weight of rucksacks and barrels of bricks, was more complex than envisaged. Without removing the barrels, lifting the canoe onto its nifty portage trolley proved strenuous. We also discovered there’s definitely a knack to using these canoe trolleys. Our first attempt was going fine but ended a little like the police car scene in American Graffiti. As it turns out, paddling with the additional weight wasn’t noticeably more difficult than paddling the empty boat. Manoeuvring and speed were pretty much the same as usual and the gunwales still sat high above the water (in perfectly calm conditions at least). Perhaps we’re just not carrying enough to make a difference to this particular canoe. The section of the trip from Spey Bay to Inverness (the North Sea) has the potential to slow us down and complicate things. Tides and wind aren’t a huge a concern on the rivers and canals but could cause us to lose a day’s progress or wash us out to Norway on the seafaring leg! 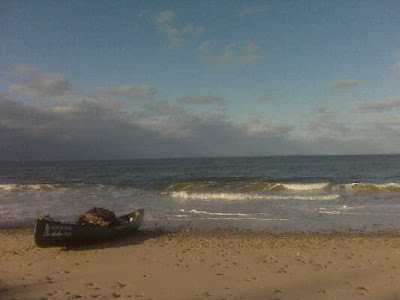 As neither of us had travelled by canoe on anything apart from lakes and rivers before an afternoon at the beach seemed as though it could prove useful to get a bit of experience, as well as being a worthwhile outing in its own right. With the Met Office forecasting winds of 3 to 4, gusting 5 and sea state slight to moderate, we headed to Jaywick, Essex on Sunday to get familiar with wind and waves. It turns out we have to be a bit of a distance from shore to avoid the breaking waves close to the shore. This was the first thing we discovered, getting fairly wet just pushing the boat off the beach. Keeping in mind the difficulties of sorting out a capsized boat without dry land close by (see our previous blog on this very subject) we are faced with a necessary (but still not outrageous) risk. Keeping the canoe stable isn’t too difficult. Even taking friends for a spin around the bay the added weight (more than the weight of our two weeks’ kit) was easily manageable. We’d quite like it if the sea was mirror flat for our trip, a pleasant temperature and came with a ready supply of sunshine and refreshing light breezes. Unfortunately; being October in Scotland it’s more likely to be cold and raining with waves and gales for the few hours of daylight we’ll get. Sitting on the beach waiting for poor weather to pass isn’t ideal but is far better than making slow progress and getting soaked and cold. With quite choppy conditions and the odd white horse, the Jaywick foray was a good preview of the type of sea conditions we are likely to face. We learnt a lot about how the boat handles and a few key things to avoid. The more canoeing specific stuff is omitted here, at a risk of boring the broader audience, but can be seen in the video description on youtube. As an important aside, thanks and recognition must finally go to our photographer, benefactor and all round good-egg, Julie. Most of the photos and videos we put up she’ll have taken and she’s also the only person so far to donate on our fundraising page (http://www.justgiving.com/bensbyboat2009). She can be seen in the photo below, albeit from a distance so as not to steal too much of the limelight. As we have told our plans to more people, many of them have warned us of the dangers of canoeing solo, particularly on large areas of open water. Alex’s mother in particular is convinced we will be swept out to sea and killed. Despite our reassurances that we will stay aware of the weather and tides, it is only sensible to be prepared and plan for the worst. Capsizing on a relatively narrow stretch of river or close to the sea shore is not a big problem. Swim the boat to dry land, tip it over and the boat is dry and ready to go again. Capsizing either in the middle of a Loch or several hundred meters into the North Sea is a much bigger problem. Learning how to do this in a raging storm with our camping gear floating over the horizon is far from ideal so we decided to get an idea of what we would be up against. On Friday evening we headed to the River Stour. The following video (part 3 of 5) shows the method we will probably use in the event of capsize far from the shore. 1/ It’s best not to capsize in the first place! 2/A boat filled with water is very difficult to manoeuvre. 3/ Bailing with a tupperware box is inefficient – we’re trying to obtain a pump to make life easier. We've set up a justgiving.com account to look after the fundraising side. You can view the page and donate by clicking on the link here. We chose the RNLI because it is very relevant to the method of fundraising (i.e. travelling by sea). The sea is nice when the sun shines and the ice-cream vans are out but much less pleasant in the teeth of a raging storm in the dead of night in the middle of winter. Tides, waves, cold, drowning etc will all eagerly contribute to people's deaths. There are some great statistics available on how long a human can survive in cold water. Suffice to say swimming back to shore takes longer than the lifeboat picking you up and therefore lives are saved. This is where my jaw dropped too. They're nothing to do with the government. Totally funded by donations and staffed by volunteers despite being on a par with two of the three main emergency services! Donations very welcome and spent usefully. The first section of the route is done on foot, starting from the car park at the Cairngorm ranger Station. We will climb Ben Macdui (second highest mountain in the UK – 1309m) and with any luck the sun will shine and we’ll be able to see the summit of Ben Nevis, our final destination. The walk is not particularly short but we still hope to be in the canoe by mid/late-afternoon. This unfortunately entails an unpleasantly early start! The canoeing starts at Loch Insh. From here we will follow the River Spey until it meets the sea at Spey Bay. It’s a good mix of steadily flowing calm sections and plenty of straightforward white water. We’re aiming to cover this section in a minimum of three days. From Spey Bay we will follow the coast of the North Sea westwards then head up the Moray Firth to Inverness. We’re aiming to cover this section in four days although this largely depends on the weather. Better late than never! The coastal chapter of our journey finishes at Inverness where we join the Great Glen. After 8 miles along the Caledonian Canal we join Loch Ness, the largest volume of freshwater in the UK. If we aren’t paddling against a substantial headwind (which we more than likely will be) it should take about a day to negotiate Loch Ness and return to the relative calm of the Caledonian Canal. Over the next few days we’ll continue along the Great Glen through Loch Oich, Loch Lochy and the River Lochy ending in Loch Linnhe at Fort William. Finding the end of the Great Glen and Caledonian Canal at Fort William is the end of canoeing for this trip. The final stage will be on foot, the ultimate aim being to reach the summit of Ben Nevis (tallest mountain in the UK – 1344m) no more than fourteen days after leaving the summit of Ben Macdui more than 200 miles ago. We (Oli Marsh and Alex Purser) are two friends from near Sudbury in Suffolk who enjoy, amongst other outdoor things, canoeing. We're not that good at it and haven't been at it very long but are forever fans of a good trip/challenge/adventure. Climb Ben Macdui in the Cairngorms and then hop in a canoe. From Loch Insch paddle the Spey to where it meets the sea at Spey Bay. Head West to Inverness along the coast. Follow the Great Glen to Fort William. Abandon the canoe and climb Ben Nevis. It's mainly a canoeing trip but we thought the two highest mountains in Scotland at beginning and end would tie it up nicely. A more comprehensive plan, maps and so on, will appear soon. The whole thing will be done in aid of the Royal National Lifeboat Institution (RNLI). They turn out at all hours in all weathers to save imperilled sea-goers from drowning and do it all voluntarily. They always need money for equipment and are deserving of a few quid from each of us to keep the service going. Today is Monday 10th August 2009. We're aiming to start the trip very early in October. Between now and then we'll keep updating this blog with all the important stuff as well as the merely interesting.